Stanley Hauerwas talks about how we cope with not having all the answers. Stanley Hauerwas offers a rationale for non-violence. Stanley Haeurwas explains why he thinks the contemporary church has gone wrong. 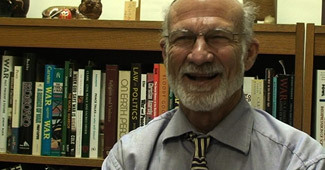 Stanley Hauerwas talks about the role of religious belief in a pluralist society. Stanley Hauerwas discusses what it means to be a human person. Stanley Hauerwas on the community and how it should be shaped for our benefit. Stanley Hauerwas looks at how we talk about death. Stanley Hauwerwas on the importance of studying theology in the secular world. Stanley Hauerwas on the relationship between religion and violence.